There is a time for coming and going; for evolving, for resting. 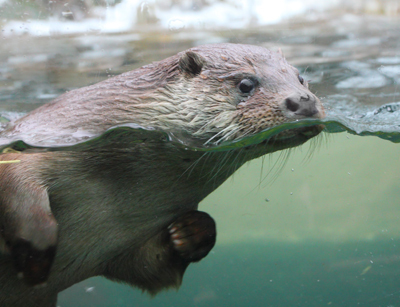 However, now is the time for quick movement away from the oncoming danger….. Be as the otter and dart about with great agility in order to confuse your foe! This is a timely reminder, dear friend: Don’t allow your good nature to cause you future distress. Yes, we all know that it would be wonderful should all within the world see as clearly as we see. However, dear one, that is just not the case. We must not close our eyes to the distressing aspects of our world. Granted, we need not partake of the energies of anger, jealousy; indeed vehemence in any of its forms. However; we do need to protect ourselves from those elements; lest we see our otherwise enjoyable state of mind deliberately abused. We must put an end to our childishness. We must put away our toys. We must allow ourselves to grow-up and see that all is not well in our world. As has been said; we need not partake of the energies abounding in the, shall we say, negative vibration. Yes, let us call those energies ‘negative vibrations’. Indeed, we do not want to see those, whose experience this time upon earth is to visit with, and enjoy, the ‘lighter vibrations’, placing themselves in an energy that has no part to play in their experience. yes dart this way and that. Putting away my toys is needed, to see others for who they are and what game they are playing. Unfortunately many are coming from a place in their lives where they have to protect themselves in such a manner that, if I allow, it will harm me. So dart this way and that I shall. I’m happy that you’ve been inspired….! Take care..
Otters rule! They get no respect… until now, that is! Thank You, Jalal, so pleased you think so; you’re words mean a lot to me..
My pleasure.Have a blissful week.